I have a very large Hebrew doc and translation. I'd like the Hebrew text to be much larger with a small translation on the side. I can put all the sentences into "paragraphs" for synchronization but there should be a way to wrap paragraphs and run an if loop where if one column is the first paragraph of a new page then the synchronized paragraph should also start on that page. As the text is now it would take a lot longer to divide several sentences into paragraphs. The image below illustrates what I'd like. Ignore the highlights. 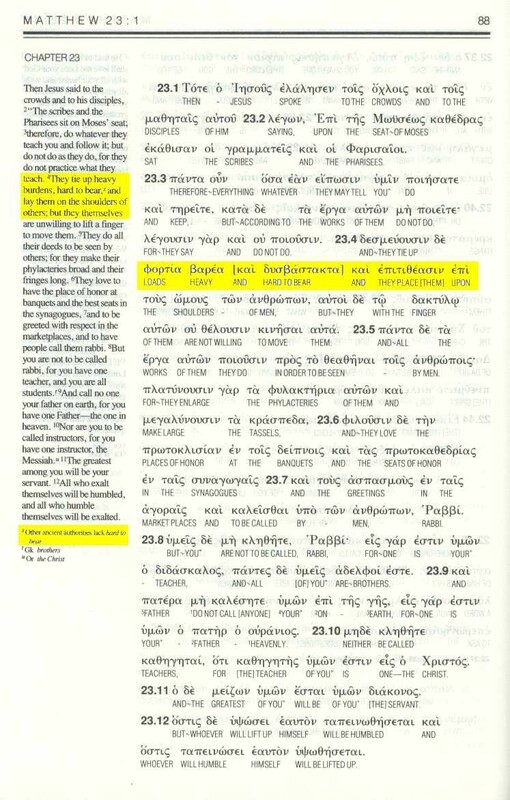 The English text sync with the Greek but only at the page break. So you need a dynamic system to inform the texts when to sync. I don't think any of the packages do this. Browse other questions tagged page-breaking reledpar parallel-texts or ask your own question. How much text will end up on a page? How to allow pagebreaks in long “cells” in a table? How do I prevent figure pages from interrupting passages?